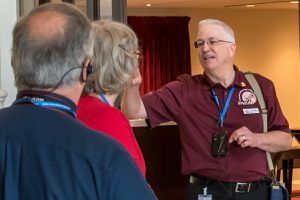 David Lane started volunteering at Music Hall in 2017. His love of history and travel, and an interest in sharing his knowledge and experiences with others, persuaded him to become a tour guide. He believes Music Hall compares favorably with some of the great halls and cathedrals in both the U.S. and Europe. David also volunteers at the Cincinnati Nature Center (doing manual labor! ), and at CooksWares, a retail cooking store, where he works as a sous chef, doing prep work and assisting visiting chefs. All of these volunteer opportunities satisfy his love of nature, hiking, cooking, and giving public presentations. An avid golfer, David is eager to hit the links as soon as the weather cooperates! A Miami University graduate, David worked for several years in television production, before starting his own company as a Manufacturer’s Representative.